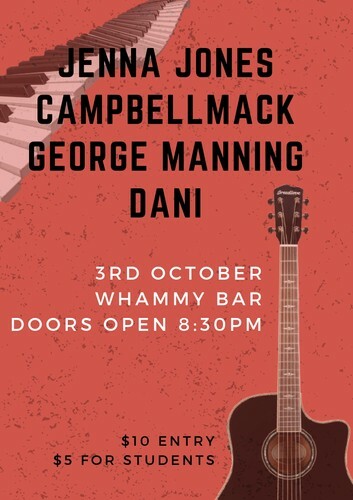 Catch Jenna Jones, CampbellMack, George Manning and Dani live at Whammy Bar. A night of jams you do not want to miss - 8:30 pm doors open, 9:00 kickoff R18, don't forget your ID youngins. $10 entry door sales and cash only. But if you're studying at the University of Auckland your entry is only $5. Just show your student ID to our gorgeous door staff and you get a night of bangers for only $5.